It all started with apples. Poor apples. They’ve had a rough go at it this year, and I missed apple picking. Unless you were on the ball, you probably missed apple picking around here too. Luckily, two of the farms at my Monday market still proudly display a full range of red and green and yellow beauties. I buy them in twos and threes and they hold me over until the next week. 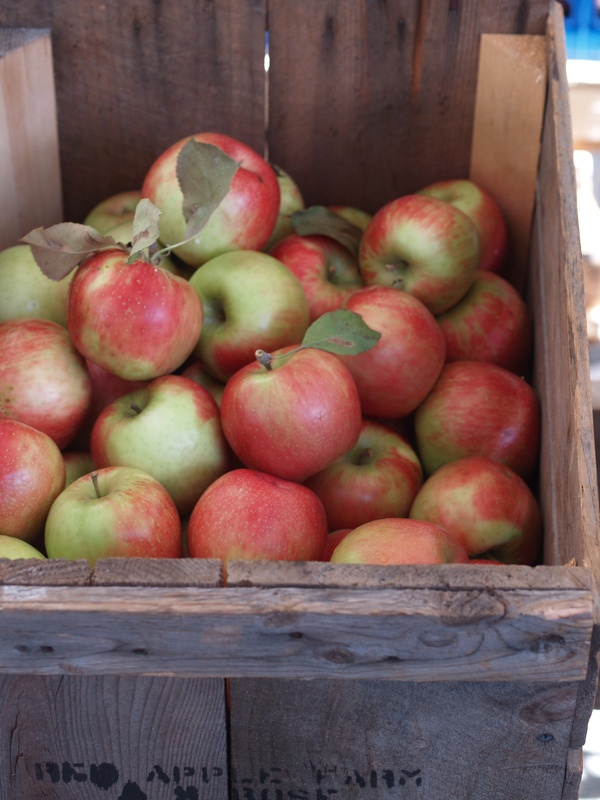 My favorite varieties are Jonagold and Honeycrisp. In the afternoon, I pull out a paring knife and balance the dull side of its blade against my thumb, pushing through the rough, unwaxed skin and covering a plate with apple slivers. I pair the slices with a spoonful of sweet creamy peanut butter. Sometimes two spoonfuls. Last week, I barely saw home, and the apples piled up. I had enough for a tarte tatin. But a tarte tatin can’t be eaten alone, so I invited a group over for dinner. The group grew to ten, the tarte grew to two, and the apples, well, I no longer had enough of them. A quick run to the store for a few more apples, and dinner was on the way. The guests arrived and we crowded around the table for eight set for ten. It was a simple dinner. We started with soup. Next up, a kale salad with roasted beets and orange. Another salad brought by a friend. And a tortilla española* that was a last-minute addition when I realized soup and salad might not be enough. Shoulder to shoulder and hip to hip, we drank wine and prosecco out of tumblers. Ten soup bowls were swiped with bread, ten plates were scraped with knives. When I rose for seconds, I found on the buffet (also known as a microwave cart hastily cleared moments before everyone arrived) a few kale leaves swimming in a large bowl, a cube of avocado embracing a spoon, and a Molly scratching the last few dark bits of egg and potato stuck to a 14-inch (!) pan. “Did I not make enough?” I whispered. Molly solemnly nodded. I looked around. My guests were sprawled on the sofa, chairs, and floor. Retreating to the kitchen, I pulled out the tarte tatins, apples still tucked under crusts whose edges were tinged with sticky scarlet pomegranate caramel. 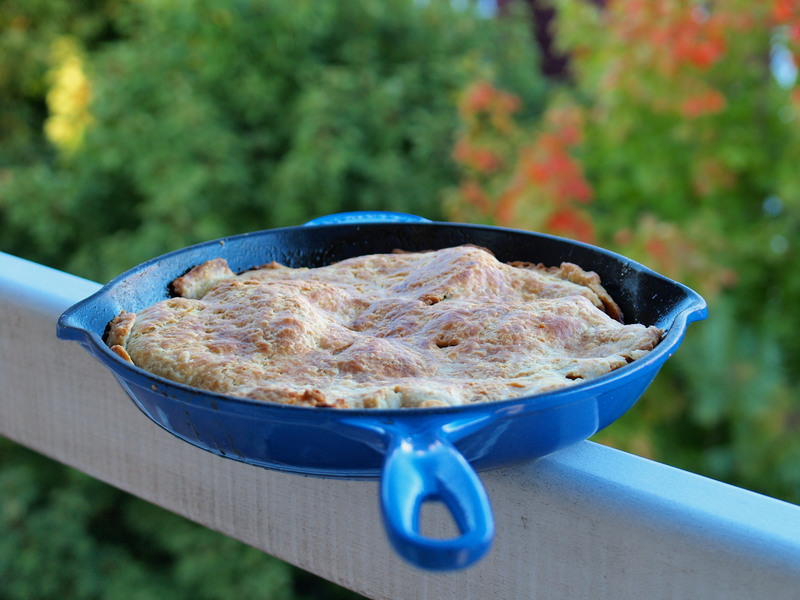 I covered each pan – first the blue skillet, then the orange – with a plate and flipped. I expected an apple or two to latch on to the skillets. I didn’t expect some of the apples to have turned into circles of mush. I guess a few of my mismatched apples** were better for sauce than pie. I hid in the kitchen for a few moments, thinking. I spooned the clinging apples and mush from the skillets and arranged them as artfully as I could. * The tortilla española. A tortilla española is a Spanish potato omelette, similar to an Italian frittata. I followed Mark Bittman’s recipe from How to Cook Everything (the yellow cover). For the recipe from the updated version of Bittman’s book of the same name (the red cover) , check out Molly’s story of her trip to Spain. Let me know if you’re interested in the version I made – I’ll gladly whip another tortilla and report back to you. ** The apples. I used a mix of market- and store-bought apples that included Mutsu, Jonagold, Honeycrisp, Gala, and Granny Smith. I did a bit of research and I think the Honeycrisps were the sauce culprits. Tarte tatin is a traditional French upside-down caramelized apple tart. Still obsessed with pomegranate, I found a recipe that combines this tart fruit with this sweet tarte (hehe!). I cut the sugar down to 1/2 cup and the tarte was still plenty sweet. I know that the recipe might seem daunting – make caramel? flip over a burning hot skillet? – but if I can do it, so can you. 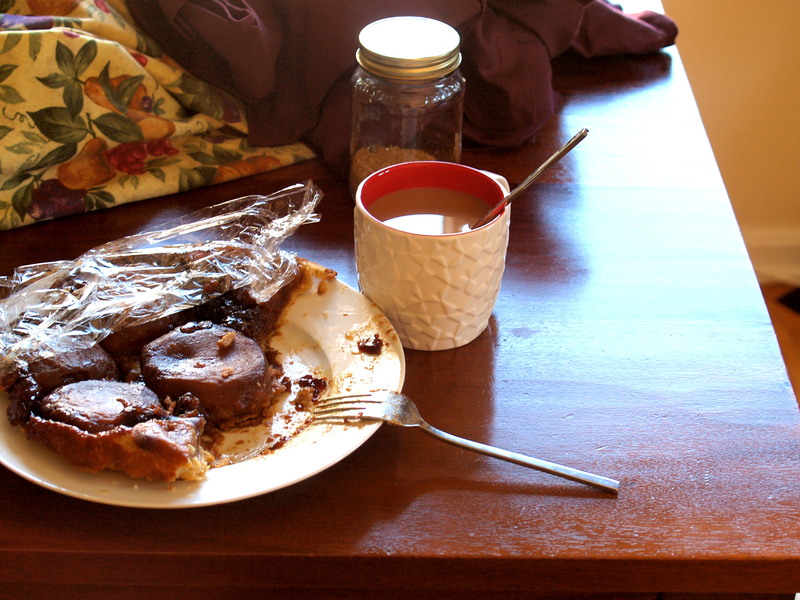 I’ve made tarte tatins with pears and tomatoes, and there are a bunch of things I’ve picked up along the way. First, the caramel. It’s pretty easy to burn the caramel, so you need to watch it closely. If you’re afraid the caramel is starting to burn, take the skillet off the heat immediately and assess the situation: let things cool down a bit, dip a fork in the caramelizing syrup, and carefully taste it. Carefully because you don’t want to burn your tongue. A slight burnt flavor – think crême brulée – is fine, but if you taste smoke, start over. Then, the flip. The tarte will be prettier if you flip it just out of the oven. Get out your oven mitts and extra kitchen towels. Place a plate on top of the pan and cover the plate with a towel. Grasp the pan-plate-towel pile with oven mitted-hands, hold your breath for a moment, and turn the whole thing over. Some caramel might spill out onto the towel, but you’ll be fine because your hands will be protected. If you want to wait until the tarte cools, it will turn out almost as pretty, but a few apples will probably stick to the skillet. Just scoop them off and put them back on the tarte. Prep. Preheat oven to 400ºF and let pie crust/puff pastry come to room temperature. Reduce. Bring the pomegranate juice to a boil until it reduces by a third (down to 1/2 cup ) into a thick syrup. If you use purchased pomegranate molasses/syrup, you don’t need to boil anything. Slice. Peel and core the apples, then slice into halves or quarters. I like halves, but you can fit more apples in if you use quarters. Caramelize. Melt butter in a heavy oven proof 9- or 10-inch skillet and then sprinkle evenly with sugar. Cook over medium heat without stirring until the mixture begins to bubble all over and turns lightly golden. This should take about 3 minutes. Remove from heat. Cook. Tightly fill the skillet with apples, cut side up, and sprinkle with salt. Keep in mind, the apples will shrink as they cook and you might be able to slip in a few more slices midway. Return the skillet to medium heat and cook the apples without stirring until a thick, deep amber syrup bubbles up between the fruit. (OK, even though you’re supposed to leave the caramel alone to do its thing, I usually flip the apples once or twice to make sure they soak up the caramel evenly. Just make sure to leave the cut ends up because when you flip the tart, you’ll want the rounded sides facing the top.) This will take about 20 minutes. Pour the pomegranate syrup over the apples – the mixture will bubble up. Cook until the juices further thicken. The apples will be a deep burgundy color. Remove from heat. With a spatula, make sure that the apples are tightly packed. Tuck. Roll out the crust between two sheets of wax paper into a circle one inch larger than the skillet (i.e., leave an extra inch all around). Slide the crust over the skillet and tuck it in around the apples and at the edges of the skillet. The crust doesn’t have to be perfect because you’re going to flip it over anyway. Cut a few slits in the crust to let air escape. Flip. Place a large plate over the skillet. Using oven mitts and kitchen towels, hold the skillet and plate together and carefully flip over the tarte. 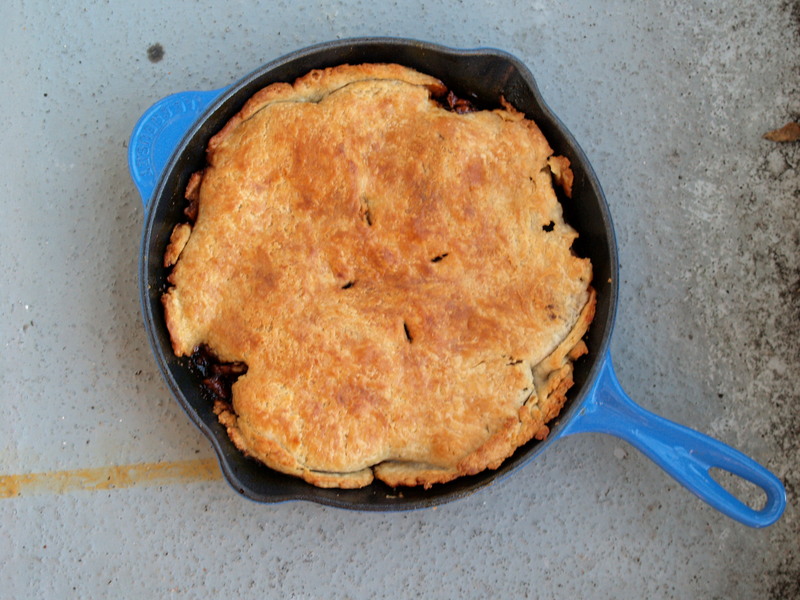 Lift the skillet — if any apples are stuck to the skillet, just put them back into place on the crust. Let the tarte cool for at least 15 minutes before serving. Confession: I had two slices of dessert. If I had been more nimble, I would have swiped a second slice of tortilla as well. Thanks so much for hosting us for Shabbat dinner. Good food, good people. Confession, Molly: I had a second slice after everyone left. And two slices for breakfast (eaten right off the serving plate). So great to have you guys over. Can’t wait to try your tortilla espanola!